Subtle yet playful, these spirited pals bring a bit of personality to your look. 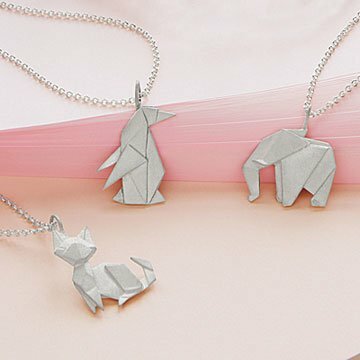 Though the Japanese art of folding paper may well be centuries old, you can't deny the modern look of these origami-inspired sterling silver necklaces. Featuring five beloved animals—from the sliest of foxes to the tallest, proudest penguin—each brings a bit of personality to your look, and Sue Beatrice's delicate handiwork ensures they appear as fine as folded paper. Subtle yet playful, they're a spirited addition to any jewelry box. Handmade in New York. Lightly wipe with a soft clean and dry cloth. Do not use a silver polishing cloth. This will match the oragami earrings I bought her for another occasion. Fun little charm. I volunteer at a cat shelter so it is perfect for me. UncommonGoods always gift wraps beautifully and makes it very special. Bought this item as a gift and my friend loved it. It is a quality piece with pretty brushed silver and unique/unusual design, charming and just a bit whimsical. The necklace is delicate, but not fragile so it should hold up well. The photos on Uncommon Goods do not do it justice, it looks a bit more elegant.